**Just to be up front, this was the beginning of a new post I was writing about some quirky history of Paris but I ended up getting a tad carried away as it ended up being very long-winded about justifying why I would even be interested in that type of thing to begin with. I completely leapt from the topic I was going to be writing about. For those who know me, I can be really nerdy. I am often fascinated with things that 'maybe' a lot of people my age really do not care/think that much about. I have tracked down and watched a lot of the first 'movies'. Not just the 'Le Voyage dans la Lune' of 1902 but all those ones with people in top hats and decadent frilly dresses walking down the street. I own hundreds of movies, mostly under the 'classic' genre. In my opinion, the best period is the 1930s and 1940s and I do make comments occasionally like "well, they sure don't make movies like that anymore". When I first watched 'Sabrina,' (the film that truly marked the beginning of my craze along with the rest of my Audrey Hepburn Collector's Boxset), I repeatedly hit the top of the TV and double-checked the cords at the back because [I quote] "There [was] no way on Earth that this [was] in black and white!" I love photography and get excited to see 'Brownie' cameras in antique stores. I get even more excited when I learn that my mum once owned said brand of camera. Sorry... 'series' of camera as a young girl. Probably though not quite as old as the ones in those stores I was so excited about. In fact, she would be horrified if I thought they were of the same era. I once helped win a trivia night at the pub something like 10 years ago because I knew Elizabeth Taylor's date of birth... Hum, I can remember lots of super important dates. My idols include Bette Davis (see awesome clip below)), Ingrid Bergman, Olivia de Havilland, Joan Fontaine, Stephen Hawking, Oscar Schindler, Daphne du Maurier, Alfred Hitchcock, Charles Dickens, Anne Frank, Michael Crawford, La môme, Rachmaninoff, Oscar Wilde, Hélène Berr... and those silent heros. Like people who have had to go through tremendously horrific life events and can still inspire other people to do great things with their lives, maybe because they have a deeper understanding of the fragility of life and what is really important. I am so proud of my bookcase that while in (independent) bookstores, I look for the copy with the most pristine and imaginative/creative cover. I also can be found in libraries but usually only for study resources. Don't want to always own those! I have a collection of antique books that I have acquired from my dad for birthdays and Christmases as well as souvenir dolls/babushkas from his travels around the world. 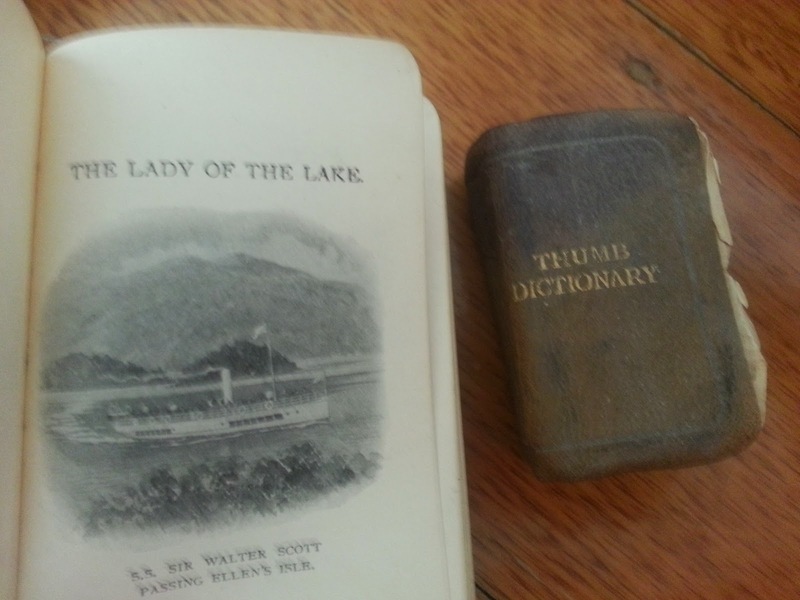 Some of the books are from the 19th century and 'thumb' sized. I own a 'Gone With The Wind' original covered book and Shakespeare's entire works, which I theoretically could use for toning those wobbly arms of mine. I love my latest Christmas one. Ahh! It's a snowman coming out of a Santa! WHY AM I A FRANCOPHILE? Loaded question really. "Phantom of the Opera" - it is THE culprit that sparked my inner francophile as a 3 year old who sang along and memorised all the words by ear as could not read as yet (even the speaking parts). I watched as many versions I could including a horrible version with Claude Raines and the original Lon Chaney black and white film. My favourite version is the 1990 TV movie with a young Teri Polo, Charles Dance and Burt Lancaster. It led me to road-tripping with my dad to Sydney aged 7 to see it performed in Sydney. Then twice when I was 10 when it came to Melbourne. Then as an 11 year old, I went overseas with my dad to see his side of the family- of course with a detour to Paris so I could see the Opera Garnier. And then I realised I really liked Paris. I studied French language in high school but ended up dropping it although I studied the French Revolution as an elective. Finally in 2007, I saw the musical again twice. I chose to go to Korea over another trip to France at 15. I discovered I loved the history, art, music, food and pretty much everything. Went again for my 21st birthday present and made the decision to start learning again as I had forgotten everything basically then hopped off to live there for a year then on and off for various other personal reasons since. Je peux écrire, lire et comprendre le français aussi facilement mais au cause de ma personalité, je suis plus timide quand je parle- mais c'est le même chose aussi en anglais ^^ Mon projet est de passer le DALF niveau C1 en 2015. J'ai déja les DELF B1 et B2. J'aime pas les romans par auteur Albert Camus. Le raison est comme J.D Salinger. Existentialisme! Et ses romans sont trop celebrés et je ne comprends pas pourquoi :-P J'adore le poesie par Paul Verlaine et Arthur Rimbaud. Probablement parce qu'un ancien prof nous disions qu'il faillait memoriser une poeme pendant une semaine pour pratiquer notre prononciation et 'flair' pour la drame quand nous la presentions à la fin! South Korea is also huge part of my life as well. You can see later posts about my travels there but this blog will be more focused on my love for France, general travelling and cooking. Korea really is an amazing country. Note: I was born in the late 80s, for anyone wondering who this granny is. I am also famous for going off on tangents at times while talking because in my head, each idea follows on from each other. Clearly. This is a prime example in itself. I don't know why I seemed to want to convince readers of my geeky status and retrospectively, a post titled "What Makes Libby Strange" would have sufficed.